Pinpoint iron accuracy. Putts true. No. Just No. When a manufaturer describes a ball as 'control', I assume it means you can stop the ball where you want it. Maybe this time they mean 'less slice'? The distance of this ball is fine, but the soft feel and spin are seriously lacking. Right out of the box you can tell the cover is hard. I love most Strata balls, especially the Tour Ultimates, TU2s, Aces, and occasionally the TU+ (cover durability withstanding, ouch.) but come on! 'control'? Where!? the ball would not stop even on a full sand wedge. Putter was also too clicky for my tastes. The rest of the dozen became range balls. I have never really like playing Strata balls for some reason but I decided to give these new Professional Control balls a try. I have used 2 so far out of the dozen I bought and I am putting them in a dark corner of my house. I played with them today for almost an entire round. They seemed very good when it came to the short game but really lacked distance for me. All of my irons were virtually 10 yards shorter than normal. I hit a 6 iron about 170-175 yards. I was barely getting 150 yardsd today. Driving distance was terribly on good shots and even wose on those hit not quite off center. I usually hit good drives around 260 to 270 yards. At some points today good drives were lucky to go 230 yards with some not so great ones going barely 200. Convinced that this was not just a problem with me hitting the ball I switched to a Strata professional distance with about 4 holes left and saw an increase of about 10 yards with irons and almost 20 with the driver. The key point for me was that I usually see dimple marks on my driver's face from the ball compressing but with the Pro Control ball I didn't see so much as a dimple. I started seeing some dimple marks when I switched to the Pro Distance ball so that means the Pro Distance is compressing more than the Pro Control. With balls like the Precept Extra Distance, Calloway HX RED and Precept Laddie I sometimes see 3/4 of a ball impression on my driver's face due to more compression. Compression is the name of the game when it comes to balls. If they aren't compressing and leaving some dimple patterns on your driver your not getting all you can out of your driver. Also try to match the ball you play to the temperature outside. A higer compression ball will compress easier at higher temperatures and a lower compression ball will compress better at colder temps. Here in AZ in the last 3 weeks it has gone from high 90's to the high 70's with an increase in humidity as well. I am going to try playing the Precept Laddie and Precept Extra Distance now. Remember to look on your driver for dimple patters to see if your really compressing your ball and maybe try something a little softer. I don't think these are bad balls by any means, they just don't work for me. For $20 it couldn't hurt to try them. This is a good ball. It has good distance off of the driver without a lot of sidespin, and a decent amount of spin off of short to mid iron approach shots. As with most Stratas, it also puts well. 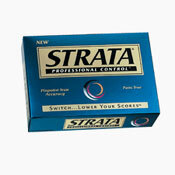 The Professional Control does not seem to have the ballooning characteristics that the higher launch Stratas exhibit. I used it this spring as my off season/lower priced back-up ball to the Titleist ProV1*. I've been trying out the Strata Pro Control, Pro Distance and Top Flite XL3000 Super Spin to find a reasonably priced ball that's best for me. I was a little surprised how much I like playing the Professional Control. It started on the practice green. I was in a rush to tee off and only had time to hit 5 or 6 warm up putts. From 20 feet I nailed 3 of them. The ball putts like a dream. They have great feel on fast greens. Off the tee, they feel solid off the clubface and they go just about as long as the pro distance. The pro distance is a very nice ball, but it doesn't have the great feel on the green that the pro control has. The pro distance seems to hold up better through 18 holes, but the pro control is pretty durable also. Both these balls go straight so I don't lose them very often. The XL3000 Super Spin is a nice ball, but it doesn't feel or putt quite as well as the Stratas and isn't as durable. Both the Pro Control and Pro distance are only $1.50/ball at WalMart. I like them both a lot. Either one of these balls can play with the much more expensive pro V1s, Tour Ultimates, etc.